Are you worried about making mistakes during the holidays that will haunt you year round? This is the time of the year when your professional conduct can help you to outclass and outlast your competition. Do you feel confident about how to conduct yourself over holiday meals or at the office party? Are you sure of the correct protocol to follow in sending out greeting cards? Do you stress over the proper way to give and receive business gifts? Stress no more! 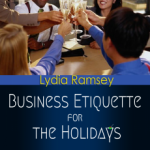 Impress your clients and colleagues with your polished manners during the holiday season. 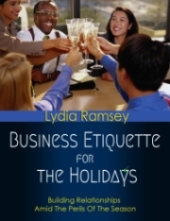 Purchase this comprehensive business etiquette guide to the holiday season by author Lydia Ramsey and you will have the tools to leave a memorable impression that will last all year. For much less than your monthly coffee budget you can learn the tips and tricks that polished professionals use to make a good impression during the holiday season. Follow the advice in this book and you will outshine and outclass your competition. Click the button below to order the PDF version or order for your Kindle here.